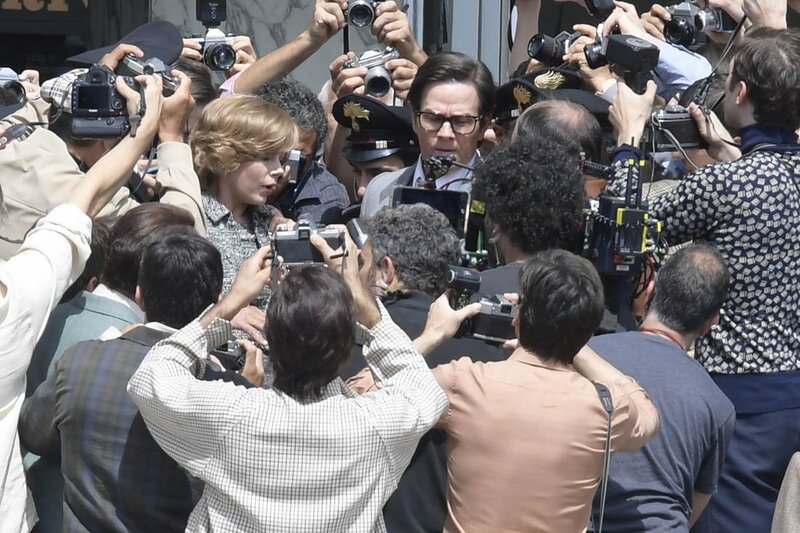 All the Money in the World was headed towards a routine Oscar campaign when it nearly got derailed because of one of its stars. In a 'how the mighty have fallen' situation, allegations of sexual harassment and assault against Kevin Spacey by a cacophony of young men (at least young at the time of the alleged assaults) forced director Ridley Scott to remove Spacey from the film and reshoot Spacey's scenes with Christopher Plummer as the oil baron J. Paul Getty. This wasn't some cameo that could be reshot over a weekend; J. Paul Getty was a major character, if not the driving force of this truer-than-true story of greed and moral corruption. The turnaround was quick, and tremendous credit should be given to Scott, who made the transition so well-done that it's hard to remember that Spacey was even in All the Money in the World or that Plummer wasn't there to begin with. This story, based on true events, will shock those unfamiliar with a notorious kidnapping, or of the wealthiest man in the world but who was so destitute when it came to a heart. John Paul Getty III (Charlie Plummer, no relation to Christopher) is living a semi-bohemian life in Rome when he is abducted. One of the kidnappers, Cinquanta (Romain Duris) calls Getty's mother Gail Harris (Michelle Williams) demanding $17 million dollars for her son's return. However, there are few things Cinquanta and his gang are not aware of. They are not aware that Gail is a Getty by marriage, and that she is divorced from J. Paul Getty II (Andrew Buchan). They are unaware that Gail receives no alimony from the Gettys and thus does not have a vast fortune of her own. What they are most unaware of is that J. Paul Getty (Plummer) will not pay a penny for his favorite grandson. He will, however, pay over a million dollars for a painting. That he will do. Gail, despite her intense loathing of her ex father-in-law, pushes to get J. Paul to pay something, but he will not budge, insisting payment will only encourage more people to take his other grandchildren and take his money. J. Paul, however, does get his fix-it-man, Fletcher Chase (Mark Walhberg) out from negotiating with the Saudis for Getty Oil to locate Paul, with the minimum of costs. Chase is good at his job, but as the months drag on with no payment forthcoming, a rescue effort fails as Paul has been sold to another group of criminals, with Cinquanta staying on. These criminals work to make the ransom a mere $4 million, but again Getty refuses to contemplate paying anything. Eventually he gives way, but with conditions. He'll give a certain amount to his son (who is not mentally competent due to his drug-addled mind): the maximum amount that can be tax-deductible. He'll also give his son the remaining difference as a loan, which he can pay back with interest. Further, in exchange for this money which J. Paul II can then give to Gail, Gail agrees to give up all rights to all her children with J. Paul II and give them to J. Paul Getty himself. Angry but desperate, she agrees. Not that it helps, as the criminals, now beyond their breaking point and after J. Paul III made a failed escape, decide to take drastic measures. They slice off Paul's ear and send it to the company, making it clear they will keep cutting parts off until the ransom is paid or Paul is dead. Even J. Paul is shocked by this but it does not move him far from his position. Frustrated, Chase berates the old man, who is shocked that anyone would dare question him, let alone his longtime fixer. Chase convinces Gail to pretend she has the full $4 million instead of just the $1 to buy time. This piques J. Paul's interest, convinced he's being played. At long last, J. Paul Getty finally gives up, giving Gail all the money she needs and voiding the previous agreement. Following the detailed instructions on the payoff, Gail and Chase make the payment but Paul, advised by Cinquanta, runs off instead of being at the designated pickup spot. It's now a race between Gail & Chase and the criminals to see who will get to Paul first. In the end, Chase retires, J. Paul Getty himself dies, and in a twist of fate, it's Gail who ends up as the trustee of the Getty estate, J. Paul II being too diminished through his dissolute life of drink and drugs and the grandchildren too young to run it. If anything shocks about All the Money in the World, apart from the ear-slicing, it's J. Paul Getty himself. Some things about him are almost hilarious though true-to-life (J. Paul Getty, for example, was notorious for having a pay phone installed in his estate to stop others from making calls on his literal dime). Others, however, are shocking in the man's coldness towards others. There is a brilliant scene that Scott and screenwriter David Scarpa (adapting John Pearson's book about the Getty kidnapping) where J. Paul arrives at a 'secret' location to make a payment. He even had a million dollars in a suitcase. As J. Paul discusses the price with an unknown man, audiences may think J. Paul is talking about his grandson. Instead, we quickly see that the exorbitant price Getty is grousing over is over a painting. It's a painting so rare and valuable that the seller tells Getty it probably can't be openly displayed (though whether any of this is legal is questionable). Getty examines the Madonna & Child he is buying, and looks upon it with a mixture of awe and greed. He says something to the effect of 'my dear, sweet boy', lending further weight to the dichotomy of a man who would not blink at spending millions for a painting or sculpture but would blanch at spending a penny for his own flesh and blood. The fact that he died clutching that painting, looking at it tenderly, speaks volumes as to what kind of man J. Paul Getty was. Throughout All the Money in the World, the character of who J. Paul was comes across, sometimes in scenes like the one mentioned above, sometimes in bits set up earlier that have a surprising and sad payoff later. Early in the film, at what appears to be something of a reconciliation between Getty Senior and Junior, the elder Getty makes a curious gift to his grandson Paul: a Minotaur he says is a rare antique. In her desperate search for funds, Gail suddenly remembers that Minotaur, finds it, and goes to an auction house to sell it. The auction house head tells her it isn't worth anything and advises her to go see his friend at a nearby museum. One stop at the museum gift shop, where she finds dozens of similar Minotaurs, is enough to devastate her to the cauldron of lies and disinterest her ex father-in-law has for people. 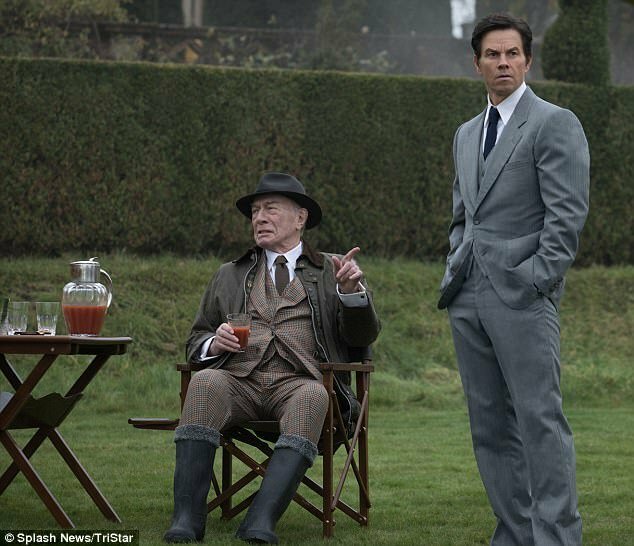 It is difficult now to see how Christopher Plummer's version of J. Paul Getty matches up against what Kevin Spacey did with the role. If, as I hope, Scott releases an alternate version of All the Money in the World with Spacey in it, or at least the scenes as a DVD extra, we will be able to compare the two. Basing things on my own memory, I think Plummer's version might be better. It's the scene where the press asks J. Paul how much would he pay to release his grandson and he replies, "Nothing". In the Spacey version available via the trailer, the 58-year-old Spacey in make-up makes this a very cold statement, a firm declaration. In the film, the 88-year-old Plummer makes this into a more dismissive, almost humorous statement, as if such a question is silly. Plummer makes his J. Paul Getty someone who is so immersed in the art of the deal that he truly cannot see past his ledger, a true-life mix of Ebeneezer Scrooge and Charles Foster Kane. As Gail in her patrician manner berates J. Paul for taking advantage of her position to wrestle all her children away from her, we see a slight discomfort in J. Paul, as if a tiny bit of him knew what he was doing was morally wrong but ultimately not 'bad' if it was in his best interests. While both the Spacey/Plummer brouhaha and Plummer's performance itself have taken much of the attention, I think we can now say that Michelle Williams really is among the best actresses working today and one who needs to work more. Her Gail was excellent: neither hysterical or cool to crisis, she was a mother working through horrific circumstances, balancing the demands of the situation with what little she had to work with. Both Charlie Plummer and Romain Duris do strong work as J. Paul III and Cinquanta, the desperate victim and the surprisingly human abductor who in the end gets a bit of redemption. If there's a flaw performance-wise, it's Marky Mark. I have never accepted the idea that Wahlberg can act, let alone be in the same league as a Plummer or Williams. Here, he has one expression: his usual look of confusion. A couple of elements that should merit note are Daniel Permerton's score and Arthur Max's set design, the latter in particular. They accentuate the characters, particularly the dark world of J. Paul Getty, who is almost always in a black-dominated room, reflecting his heart of darkness. All the Money in the World generally moves well, in particular the last half-hour as Gail and Chase race to save Paul from his abductors. It has strong performances from almost everyone and tells this sad story with grace and respect. People think money is the root of all evil. That is a misquote from Scripture. 1st Timothy 6:10 says it's "the love of money" that is "the root of all kinds of evil". For better or worse, few people have lived that verse out more than J. Paul Getty, and that root ended up devouring his future generations.